A magic trick teaching tool. The Nintendo DS is your assistant as you learn how to perform magic tricks and put on performances. In Solo Magic, you can try out a series of minigames where the DS tries tricks out on you. 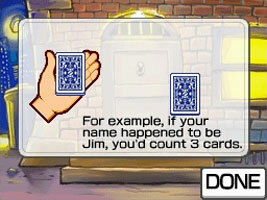 In Magic Show you can put on a show for your friends and family with over 20 tricks that use the Nintendo DS. In Magic Training, you can test your skills and get rated on your performance over time. You can also unlock new tricks by earning Magic Points in each mode. The game comes packaged with a deck of cards so you can practice various card tricks. Barbara, the bat from the rhythm-action Band Brothers series appears throughout the game. Included with the game is a Nintendo branded Ace of Spades playing card, based on a design when the company was a playing card manufacturer. This design also features prominently on the game's packaging.